I don't think you could ask for a cuter paperweight! 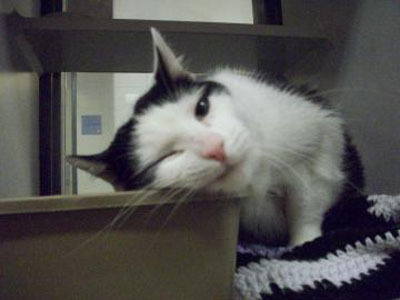 Lucy is a 7-year-old female cat with a lovely black and white coat. She was brought to Lollypop Farm because her owner was moving and couldn't take her along. Lucy will be happy to hold down the page for you while you read your newspaper. And, if you're watching television, she'll oblige by plopping down in your lap so that you can pet her. This sweet kitty enjoys attention and will reward you with kisses and a loud purr. Lucy is available in the Seniors-for-Seniors program, so adopters age 60 and older can take Lucy home to cuddle up on the sofa at no charge! Lucy can't wait to meet you. Come and see her today! Brandy, the dog from last week was adopted!